Big Time Gaming has managed to yet again fill us with glee and anticipation, with their innovative slot that comes to life on your desktop, mobile and tablet. An original idea, great design, incredible graphics, and engaging bonus features are what it takes to make a superior slots game today - free spins, multipliers, megaways and and more! Read our full review below. Big Time Gaming’s Bonanza online slot is a Megaways game that offers you plenty of opportunities to win big – over 100 000, in fact. It is a popular game among online slots players around the world thanks to its hugely generous format and its exciting bonus features. When you enter the game, you'll be whisked off to a beautiful woodland retreat. With green grass and a rocky environment, it's filled with flowers and character. There's a wood cabin to the side of the screen, and an animated water wheel running constantly. The maker has taken a lot of time to create this beautiful scene, and you won't be disappointed. The reels are set in stone. It's here where you get the impression of a mining-themed slot. You'll want to pick something up and break right through them, but unfortunately, you'll have to be patient and spin to win. There are six reels, and while they're spinning hillbilly music plays continuously. It's fun, and you'll be dancing in your seat. The basic and most common symbols on the board are the cards. They range from 9 to the Ace and will pay varying amounts. The other basic symbols are gems. You'll have to dig around to find them, but they're worth it. They'll help you create some strong winning combinations. Upon first glance, Bonanza seems a pretty complex slot. After all, it has six reels rather than five and there is a different number of symbols on the reels every spin. However, you’ll be pleased to know that Bonanza is actually quite simple. Each reel can show between 2 symbols and 5 symbols, and there’s a set of small reels along the top of the screen. Since each reel shows a different number of symbols, the total number of winning ways varies with each spin. This is how the Megaways mechanic works, and you’ll see it in plenty of Blueprint Gaming and Big Time Gaming slots. You can wager between 20p and £200 per spin, which is the perfect range for players with smaller and mid-sized budgets. High rollers, too, should be able to get their kicks as they’ll get plenty of value for their bankrolls. An autoplay function is available for up to 100 spins, and you can set a loss limit or single win limit along with it. There are no other controls in the game, however, such as settings for the volume or the reel speed. When using the Autoplay function, you have the option to set a loss limit and a single win limit. The single win limit comes in handy if you're the kind of player who likes to quit while they're ahead. If you've hit a large win, the game will stop playing, and you'll be able to determine whether or not you want to collect those wins or keep spinning. The loss limit setting is one that we would advise using, no matter what your budget. It's a good idea to set a loss limit so that you don't deplete your bankroll too quickly. It's a great way to keep track of your spending and ensure that you're playing responsibly, as you can reevaluate after you've hit your loss limit. To hit a winning combination while playing Bonanza, you have to land three or more matching symbols on adjacent paylines. This differs from payline-based games, as if offers up more winning potential overall. The top prize available in Bonanza is worth 50x your stake, and it's awarded by the diamond symbol. It is, by far, the most generous symbol in the game, as the next most generous prize is worth 7.5x your stake. Bonanza is a high-paying online slot game, but that doesn't mean it offers up a progressive jackpot prize. All of the prize are preset, and they are paid out as a multiple of your stake. The top prize available is worth 50x, which is still very generous considering the cascading wins feature. Every slot player has wondered at least once - "is there any way to guarantee a win?". It's a natural thought; after all, there is money on the line. However, we can assure you that there is no way to actually secure a win while playing any online slots, including Bonanza. This is because all online slots games run on Random Number Generators (RNGs). This complex software does thousands of calculations per second to determine which symbols will appear on the reels, making it completely impossible to determine or manipulate the result of any spin. What we can advise you, however, is to practice smart bankroll management - so you'll always be able to walk away from each session at least feeling like a winner. Ensure that you decide how much money you can spend per month playing casino games online and use that number to determine how much you can spend per session. It's a good idea to deposit your monthly amount at once, so you're not tempted to make additional deposits later if you happen to deplete your bankroll. We also advise using the deposit limits at the casino. You can use your Account Settings to set a limit to the amount of money you can deposit monthly, weekly or yearly. This will ensure that you never dig deeper into your pockets or chase losses. Whenever you're playing slots, you should split your winnings. Half should go back into your bankroll and the rest you can withdraw. Or, you can decide to split it however you like. The point of this is to walk away with a bit of money in your pocket so you've got some winnings to spend. Finally, never - ever - chase your losses. It may be tempting to spend a few extra bucks to reclaim what you've lost, but it is not advised at all. This can lead you down a dark road, and it's best to exercise some restraint. To trigger the free spins round in Bonanza, you have to land four symbols that spell out GOLD during the base game. You'll receive 12 free spins, and you can trigger 5 more with every additional scatter symbol that lands. What really makes this bonus special is the unlimited win multiplier. Whenever you hit a win, the multiplier will increase - and, there's no telling how high it will go! You can also earn extra free spins - 5 more free spins for 3 scatters and 10 more free spins for 4 scatters. When you combine the cascading wins with the unlimited multiplier and the potential to earn more free spins, Bonanza offers up a very impressive bonus round. It can be pretty difficult to trigger, but if you do, you'll be laughing all the way to the bank. No Feature Drop? No Problem! Most of the Megaways slots from Big Time Gaming include the Feature Drop mechanic, which allows players to purchase the free spins round outright. The price ranges from 25x to 50x their stake, but it always tends to be worth it - as you're sure to earn more than that in the resultant bonus game. In Bonanza, this mechanic is missing, which is a shame. At first glance, it's pretty disappointing that we can't pay to trigger the free spins bonus outright, but once you get playing you don't miss it at all. This is thanks to Bonanza's cascading reels. Whenever you hit a winning combination, the winning symbols explode and new symbols take their places. What this means is that you're given the chance to win multiple payouts on a single spin, which is essentially like a built-in respin. It happens often enough that you can earn some impressive wins along the way. What Is the RTP of Bonanza Slots? Bonanza from Big Time Gaming has an RTP (return to player) of 96%. This payout percentage refers to the amount of money that players can, on average, expect to earn as prizes. It is also known to be a high volatility slots game. This means that you’ll be able to cash in on very generous prizes as you spin the reels, but they’ll come around pretty infrequently. It’s the opposite to a low variance game that offers up more frequent, smaller wins. So, while Bonanza has a great betting range for penny slots players, the actual gameplay is better suited for players with larger budgets. This is because you’ll experience fewer wins overall when playing a high volatility game like Bonanza – even if your overall profit at the end of your session is larger than it would be on a low to medium volatility slot. In the times between your wins, there is the potential for you to deplete your bankroll if you hit a particularly cold streak. So, if you’re a player with a smaller budget, remember to be smart about how you bet. It’s wise to go for quantity in a game like this, spending less on your wagers so you can fit in more of them during your gaming session and keep yourself in the black in between wins. Before you get playing Bonanza online slots, it's always advised that you give the demo a spin first. This is so that you can get a proper feel for the game without having to worry about spending any money if you don't happen to get on with it. We always advise playing between 150 and 200 rounds for free before you decide to make a real-money wager on any slot. It's important that your play-money wager is similar to what it would be if you were playing with actual cash so that you get a good idea of whether or not it will fit within your budget. If you just don't have time to play 150 rounds of Bonanza slots right now, then we have you covered. our 150 Spin Experience provides you with the in-depth insight you need to know exactly what it's like to give this game a spin. Our bet. We decided on a stake worth £5, which should be a fair compromise between players who have limited budgets and those with a bit more cash to spend on slots. It's easy to adjust your wager using the tool in the bottom left-hand corner of the screen. Just click the arrows until you've arrived at the stake you prefer. Graphics and gameplay. Just as you would expect a Big Time Gaming slot to play, Bonanza has smooth gameplay and impressive graphics. Even with a few windows and tabs open, the game runs very smoothly and the graphics are just as eye-catching as they are in screenshots. Our wins. As a high volatility game, Bonanza is the kind of game that pays out very generous prizes - albeit less frequently than in medium and low volatility games. As a result, we were left waiting quite a while between significant wins. The most common prizes that we earned range from 3x to 4x our stake, but we did manage to cash in on a couple of prizes worth 20x our stake. Bonuses. The cascading wins were awarded frequently, so we benefited from the multiple payouts often. Unfortunately, we weren't able to trigger the free spins round. This is where the Feature Drop would have really come in handy. Still, it's a totally randomized game, so you may have better luck than us! If you've decided that you like what you see and want to play Bonanza at a real-money casino, then it's important to consider the bonuses that you can claim. If you're new to online gaming at real-money sites, you should make a shortlist of the sites that you're considering, and the bonus offers should certainly be a crucial consideration. It's always best to look out for an online casino that offers the game Bonanza and provides you with a 100% welcome bonus. Anything less than 100% really isn't worth claiming. You should also take a look at the minimum deposit required to claim the bonus, as this can sometimes be a bit steeper than casual players would like to spend. Another good idea is to keep an eye out for multi-step welcome bonuses. These are welcome packages that provide you with match bonuses on your first three or four deposits. Usually, only the first deposit is matched by 100% and the rest range from 25% to 50% - but it still makes for a generous boost to your bankroll over time. Free spins also tend be included in welcome bonuses. It's unlikely that you'll be able to claim Bonanza free spins as part of a registration package, but you will get the chance to play other great casino games. Usually, slots like Starburst and Aloha Cluster Pays are available as free spins games. Then, consider the wagering requirements, which let you know how much money you have to spend before you can withdraw the initial bonus amount. So, for example, if you claimed a £10 bonus with a 25x wager requirement, you'd have to spend £250 to release that first £10. However, most online casinos release your funds little by little, so you don't have to worry about spending a big chunk of change at once. Most online casinos have wagering requirements of about 35x. However, you may be able to find an online casino that offers them as low as 25x - but, always keep a cautious eye for anything that seems too good to be true. On the higher end of the spectrum, wagering requirements can go all the way up to 50x, and it is best for players with smaller budgets to avoid these sites. No deposit bonuses are very popular at online casinos nowadays, allowing you to play games without having to spend any cash. They are usually awarded as a cash bonus worth anywhere from £5 to £10 (or as free spins) as soon as you sign up. If your no deposit bonus is granted as free spins, these are usually allocated on a specific game. It's not often than Bonanza is a no deposit free spins slot, but you can play other popular titles. Your wager is usually set to about 10p and you can keep your winnings up to a certain amount of money (usually up to £100). To truly play Bonanza as a no deposit slot, you can give the demo a spin here at Slots Temple. You don't have to spend any money or make any deposits to play this game here, but it's important to remember that you're only play for play-money prizes. Big Time Gaming 's Bonanza is filled with adventure from start to finish. The concept is unique and entertaining, and the music gives the game a light-hearted feel. Your adrenaline will be racing as you spin the reels, and there's a lot of opportunity for winning combinations. Our main gripe about Bonanza is that the free spins round can be pretty tricky to trigger. You have to be really, really lucky to get your hands on this bonus game. Other than that, Bonanza really is a great game that offers up all sorts of winning potential. The graphics look real, and it takes you to a charming place with the animations being a bonus we welcome. The underground feature is the best by far. You'll love watching the mines blow up and want to play over and over. The makers have surpassed our expectations with this one. White Rabbit. White Rabbit is an online slot from Big Time Gaming that features impressive winning potential. The Megaways feature is enacted during the bonus game, where the reels expand with every cupcake symbol that lands on the reels. If you fully expand all of the reels, you'll have over 200 000 winning ways at your disposal! Buffalo Rising Megaways. Buffalo Rising is a Megaways slot game that comes from Blueprint Gaming. It features vibrant graphics and offers players up to 117649 ways to win. The game features a generous free spins round with increasing wilds and cascading wins. It also comes equipped with the Feature Drop function that allows you to purchase the free spins round immediately. 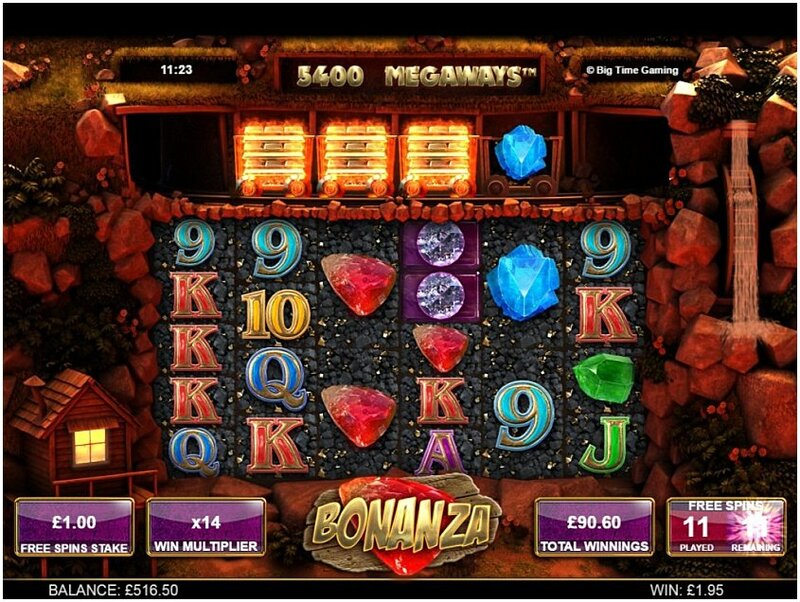 Diamond Mine Megaways.This slot is similar to Bonanza both in theme and format. The game offers players up to 117649 ways to win on every spin, and cascading wins are also present. You can also earn free spins with increasing multipliers. Dragon Born. Dragon Born is the slot that started it all, as the first-ever Megaways slot from Big Time Gaming. With an epic medieval theme, this game keeps you entertained with each spin of the reels and offers up very generous winning potential. Like most Megaways games, you can activate up to 117649 ways to win - and, there is the adding bonus of potentially landing up to 50 free spins. Boom Brothers. This is a NetEnt slot with a theme that is quite similar to Bonanza. This mining-theme game features 20 paylines and offers up a top prize worth £37 500! It has a free spins round and a mine cart bonus which is an arcade-style mini-game that offer up some impressive prizes. Gonzo's Quest. If want to play another great game with cascading wins, then look no further than Gonzo's Quest. This NetEnt-powered game offers up very generous winning potential, providing players with the chance to hit multiple winning combinations on a single stake. With each cascade, multipliers increase so you can cash in on some very impressive prizes. Where's the Gold. Where's the Gold is the original mining-themed slot. This is a classic slot from Aristocrat that is geared more towards players with traditional gaming tastes. It's a hugely popular game around the world, and offers up a fantastic free spins round with extra wilds and generous multipliers. Can I play Bonanza slots for free? Bonanza is one of many online slots that we offer here at Slots Temple. There are over 3000 games for you to enjoy without having to wager any cash. Does Bonanza slot have free spins? When you spell out the word GOLD during the base game, you’ll trigger 12 free spins. For every additional scatter, you’ll get another 5 free spins. Can I win real money playing Bonanza slots? If you’d like to win real money, visit a real-money casino that is powered by Big Time Gaming. Where I can play BTG’s Bonanza slot for real-money prizes? There are a few casinos where you can play Bonanza, such as Casumo and Play Ojo . At Casumo, you get a no deposit bonus of 20 free spins and a 100% match bonus, while Play Ojo offers you up to 50 free spins on your first deposit. What should I do if BTG’s Bonanza slot is not working? If you want to play Bonanza and the game doesn’t seem to be working, please contact us at support (at) slotstemple.com. We’ll get it up and working again right away! Can I play Bonanza slots with no deposit? Bonanza is available as a no deposit slot here at Slots Temple. You have 1000 free play credits to use on this game however you like. Are there any Bonanza slot tips and tricks to help me win? Bonanza runs on an RNG, which means that there’s no way to predict or manipulate the outcome in any way. So, the only Bonanza slot tips that we can offer regard bankroll management. This means that you should always set a budget that you can afford, and ensure that you have enough wagers within that budget to provide you with at least 50 spins on the game. This ensures that you’ll get enough spins into your session to accumulate wins. Can I download Bonanza slots? There’s no need for you to download Bonanza because it is an HTML5 game, which means that it will load in your web browser. Is BTG’s Bonanza slot available for Android? Big Time Gaming’s Bonanza slot is available for mobile all mobile platforms, including iOS and Android. Whether you’re playing on a tablet or a smartphone, the game will load in your browser. The main achievement for Big Time Gaming has been the development of its Megaways mechanic. As demonstrated in Bonanza, this mechanic activates a different number of winning ways per spin, with most games in the series offering players up to 117649 ways to win. Games like Bonanza and White Rabbit have made this mechanic so popular that Big Time Gaming has even started licensing it out to other developers. So far, Red Tiger Gaming, WMS and Blueprint Gaming all have licenses to create their own Megaways games, and we can't wait to see what they come up with. * Bonanza trademark / license is owned by Big Time Gaming. This site is not endorsed by Big Time Gaming.